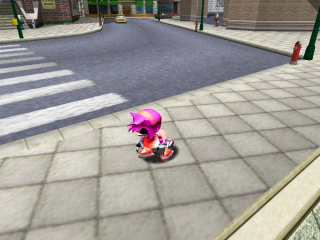 Metal Amy Adventure DX is a hack of Sonic Adventure DX, replacing Metal Sonic with fanmade character, Metal Amy. Replaces Spin Dash with Super Peel-Out. The Super Peel-Out only works when standing still. Sonic Adventure 2-style Light Speed Dash (just press the action button) which doesn't work when standing still. Metal Amy doesn't lose speed after a light dash. Metal Amy uses running animation instead of hovering animation. Jumping doesn't make the player spin. Super Sonic has been replaced by Super Metal Amy.